Strange how so many in the U.S. demonize Muslims and Islam. Then again, it's not surprising that we don't much understand that approach to the world, since we are taught very little beyond Western Civilization in school. That's precisely why it's so important that we all read Tamim Ansary's Destiny Disrupted: A History of the World Through Academic Eyes. 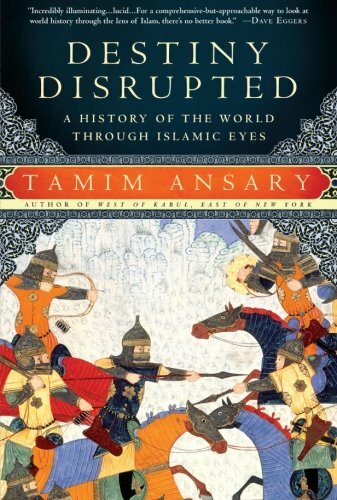 In the book, as noted in past reviews, he tells "the rich story of world history as the Islamic world saw it, from the time of Mohammed to the fall of the Ottoman Empire and beyond. He clarifies why our civilizations grew up oblivious to each other, what happened when they intersected, and how the Islamic world was affected by its slow recognition that Europe - a place it long perceived as primitive and disorganized - had somehow hijacked destiny." Ansary himself says the book is "like what I’d tell you if we met in a coffeehouse and you said, 'What’s all this about a parallel world history?'" One key geographical feature sets Mesopotamia apart from some of the other early hotbeds of culture. Its two defining rivers flow through flat, habitable plains and can be approached from any direction. Settled farmers would build irrigation systems supporting prosperous villages and towns. Eventually some tough guy, some well-organized priest, or some alliance of the two would bring a number of these urban centers under the rule of a single power, thereby forging a larger political unit - a confederation, a kingdom, an empire. Then a tribe of hardy nomads would come along, conquer the monarch of the moment, seize all his holdings, and in the process expand their empire. Eventually the hardy nomads would become soft, luxury-loving city dwellers, exactly the sort of people they had conquered, at which point another tribe of hardy nomads would come along, conquer them, and take over their empire. Later, the Persian Empire stands out for several reasons. First, the Persians were the counter-Assyrians. They developed a completely opposite idea of how to rule a vast realm. Instead of uprooting whole nations, they resettled them. They set the Hebrews free from captivity and helped them get back to Canaan. The Persian emperors pursued a multicultural, many-people-under-one-big-tent strategy. They controlled their enormous realm by letting all the different constituent people live their own lives according to their own folkways and mores, under the rule of their own leaders, provided they paid their taxes. The Muslims later picked up on this idea, and it persisted through Ottoman times.